Update 09/01/09: Based on twitter feedback, I need to clarify that InfoPath is supported in the sense that BPOS provides forms libraries. What I mean when I write "not supported in any way" is that InfoPath forms services functions are not supported. That means that you can’t publish an InfoPath form to BPOS and and have it render in the web browser. It also means that some out of the box workflows, which use InfoPath (even in MOSS standard edition) don’t work in BPOS because their initiation and other forms use InfoPath. Hopefully that clears things up. I had a chance to really dig into Microsoft Online’s offering earlier this year and specifically the business productivity online suite (BPOS). This came along before I even hard a firm plan to set out on my own at Arcovis. I immediately saw, however, that BPOS could be a key part of my company’s internal infrastructure and over time, it has become exactly that. Arcovis, uses it on a daily basis. I thought I’d share some of that experience from a practical perspective in case you want to evaluate it for yourself or are just curious about it. You can buy each of them separately, I believe. It’s all spelled out relatively clearly on the Microsoft online site. You may be able to get better deals through MSFT partners. Arcovis has been working with Cloud Strategies and they seem to know their stuff, so I’d include them in your list of vendors if you do a multi-vendor search. I outline my experience and thoughts for each of these respectively. This is a hosted exchange environment and from my perspective, it works like any other Exchange server I have ever used. It’s fully integrated with all of my fellow Arcovis partners’ environments and gives me access to the calendar (which is huge). Good stuff. 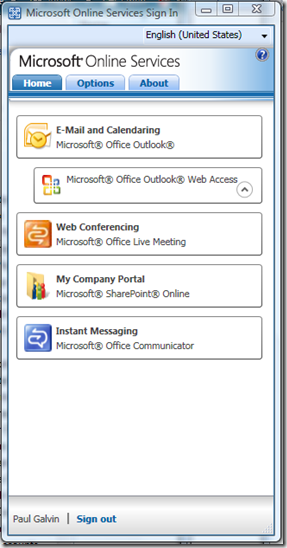 It also provides the Outlook Web Access (OWA) interface. That means I can get my email on any machine that has a web browser. My HTC mobile phone, running Windows Mobile 6.1(?) connected to it nicely via Active Sync. It did this in exactly the way I expected and wanted. I don’t consider myself much more than a casual outlook and exchange user so there may be really important Exchange features that just aren’t supported and I wouldn’t necessarily know it. I think the strongest recommendation I make for this is that I am completely unaware that my exchange environment is “somewhere else.” I don’t know see any difference in Exchange and how I use it on a daily basis versus the half dozen or so other times I used someone’s exchange environment. In fact, this is better because it simply works. Bottom line – hosted exchange is what it needs to be and I’m very happy with it. This is a truly indispensible tool when you’re in the consulting business. I fire up instant live meetings several times a week to show intermediate work product to clients, to watch them break my solutions so that I know how to fix them, do sales presentations, etc. Live meeting is bundled with BPOS and it’s very easy to use. I’m even less of a live meeting expert than I am on exchange. However, for my purposes, it’s great. So far, I use communicator almost only for presence information. I say “only” but have that presence data available to me whenever I’m connect has become addictive. With communicator installed and running, my colleagues know when I’m available, what my schedule is like at this moment, and can IM me (though the IM interface is pretty dull, at best). It’s one of those things that I really miss when I don’t have it. I actually get a little annoyed when my colleagues aren’t running communicator because the presence information is missing. The presence indicator feels pervasive. It shows up in SharePoint whenever their name appears as an author to a document, assigned a task, etc. It shows in email, embedded right in outlook. It shows up in the communicator client itself. For the most it just sits there running in the background and decorates my outlook and SharePoint screens with real-time presence information. It’s very cool. My favorite bit, of course, is SharePoint. Sales (proposals, lead tracking) –> we do plan to invest in a CRM solution but for now, SharePoint is working out as our CRM solution. Basically, all the stuff you’d expect to use SharePoint for. I cannot provide anonymous access. In fact, i don’t think I can do that for any price. I could be wrong, or hopefully MSFT will change this in future. No InfoPath of any kind. This has the slightly strange side effect of blocking a few standard MOSS workflows that rely on InfoPath. No proper SDLC (i.e. features/solutions). No access to a shared service provider. The last bit is a little sad because we can’t do as much search configuration I would like. You basically give up a lot of technical capability and are forced to live within the confines of out-of-the-box SharePoint functionality. I can live with that. I have found myself wanting to slap together an event receiver or use a custom action once or twice,, but for the most part, I don’t notice the lack. I should add that this is not a comprehensive list of the differences between a hosted “on prem” MOSS environment and SharePoint on line. Cloud Strategies has a very detailed presentation that goes into all that if you’re interested. I’m speaking from the perspective of a business owner leveraging the tool. 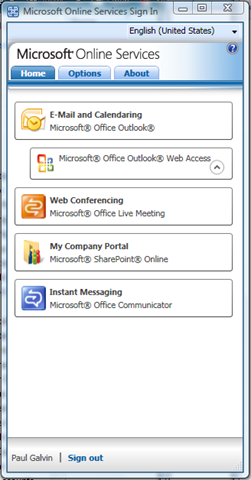 You don’t need to use it, but eliminates the need to log into each of the applications separately and for live meeting, It’s quite nice because you can do a “meet now” session with just 2 clicks (one on the “web conferencing” button above and another on the web browser that pops up). It’s also nice to get OWA with one click, though you can just put that in your browser favorites as well. The other major advantage with this desktop application is that it provides a background kind of single sign on service. As long as this is running in the background, I can open up web browsers and connect to my BPOS environment without ever needing to enter credentials. Microsoft made BPOS available to me for free so I am not currently paying the monthly per user fee at this time. However, I see value there and you can accept on faith (or not) that I would pay for this service. The fact is that I can’t count on Microsoft providing this for free forever and it’s become so strongly integrated with my business that moving … the mind quails. BPOS is an insanely feature rich platform. Exchange, SharePoint (MOSS Standard! ), presence, instant live meetings – it’s a lot of functionality that I would sorely, sorely miss if I had to live without it. My business would be severely impacted without it. Could I find replacement functionality? Probably, but I think I would have to cobble it together from a variety of other vendors, complicating my life. BPOS has so far proven itself to be stable and reliable. For the right kind of customer (like my company), BPOS is worth strong consideration. This entry was posted in SharePoint on September 1, 2009 by Paul Galvin.